LaRueLa: First new art of 2011! ﻿Well I couldn't wait any longer! After perusing some of my favorite blogs and being so inspired over the holidays I finished a mixed media piece. Oh definitely feel better! Very satisfying after such a long break. I had intended to post some sneak peeks of it yesterday but somewhere between work and home the photos I uploaded didn't show up on my computer. So I decided I better just finish it now! I took the last two photos below and then decided I really wanted to paint the bird. He just seemed incomplete still and I think I made the right choice to paint him. What do you think? 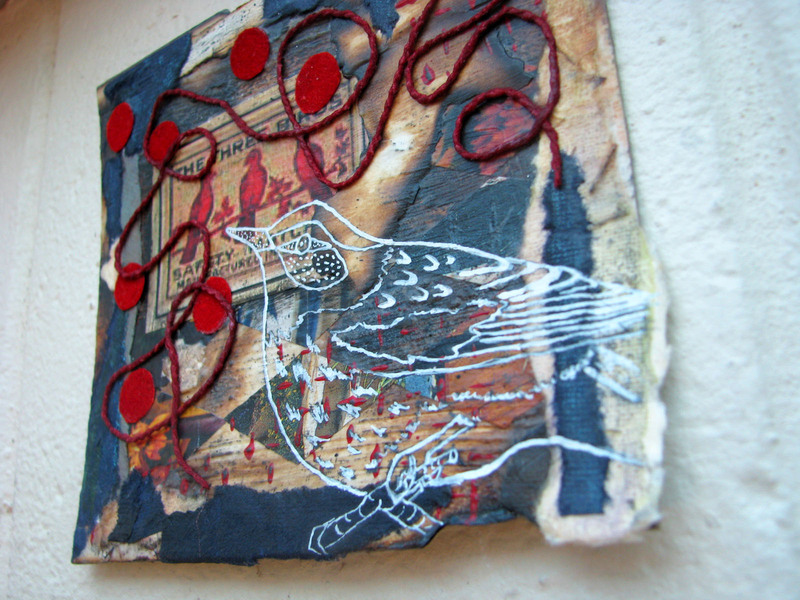 I began by using a piece of illustration board that I had layered with glue and then burned with a torch. I found some photos on a website with ephemera and I really liked the ones of old matchbox covers. I never realized how pretty matchboxes were. Then I started layering on diamond shaped pieces of magazines and torn paper with matte medium. I drew the bird in white acrylic ink and cut out some fuzzy circles and a piece of string to add to the composition. I also had an old piece of screen that I coated with paint and pressed onto the board for a pattern. I really just wanted to paint that bird too but I still wanted to see the layers underneath so I made sure the paint was translucent. Overall I am pretty pleased with it! I wish I could do that all day long! painting the bird brought it to life! Neat stuff Laura! Kerri I wish I could take photos like you! I've got your tree in mist photo as my desktop right now it's so beautiful! And drawing is just practice! You are your own worst critic. Drawings don't have to be realistic to be appealing. Develop your own unique style! Hi Laura, thanks for visiting my blog! I love that you painted that bird in. Definitely brought to life as the first commenter wrote. I'm going to be teaching a workshop in chicago next month- just a small 3 hour one. I'll be announcing it on my blog soon. Do you know Crystal Neubauer? She's going to be teaching at encausticamp too- she lives in your neck of the woods! Her blog is called Other People's Flowers. You should check it out. Thank you so much Bridgette! I will definitely look for the information on the workshop. And I will have to look up Crystal Neubauer...her name sounds very familiar. 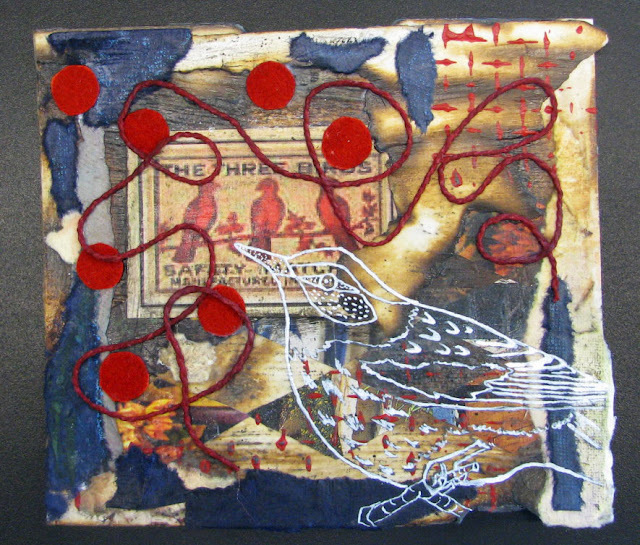 I judged and art show late last summer and there was an incredible encaustic painter entered. I'll have to look her up to see if it was her. I'm so excited to meet you! 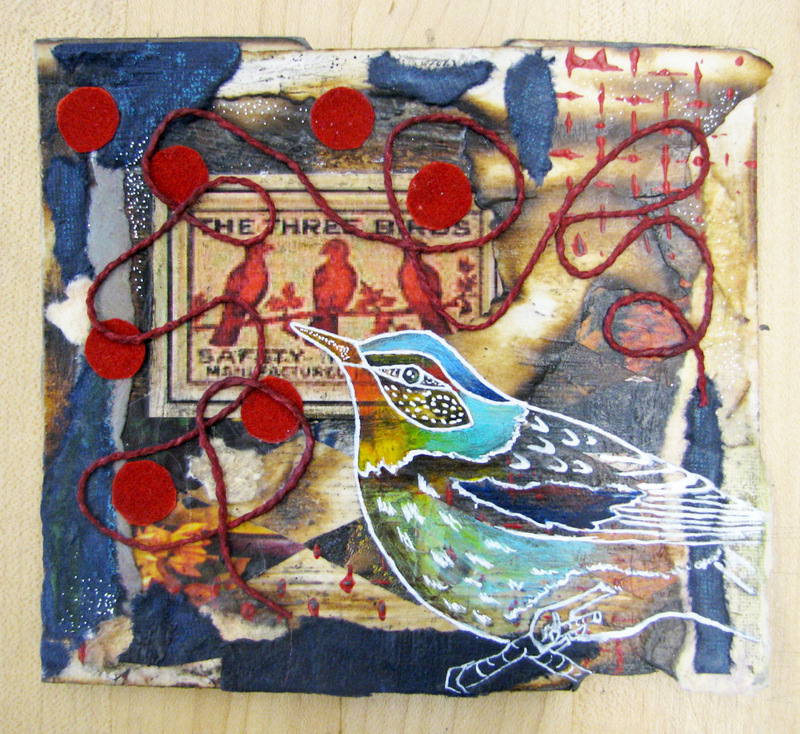 Thanks for signing up for the encaustic workshop in February. I actually was mistaken about where Crystal lives, she lives further north in Grays Lake. Got the names mixed up! Anyway, looking forward to the workshop....Thanks again!